Most people like a fried egg before they get to the golf courses but no one wants to find one in a bunker on the course. 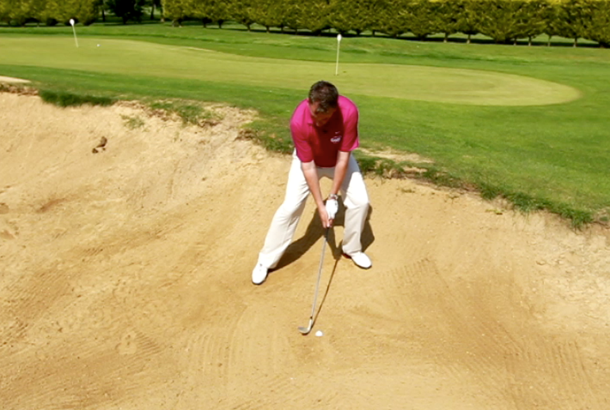 The normal shot from a plugged bunker lie would produce a low running shot, but what do you do if the pins close and you don’t have much green to work with? In this video tip TG Elite Teaching Pro Adrian Bishop shows you how to play a high risk escape that could help you save an unlikely par. Take a very wide stance, get your hands low and present the sharp heel of your most lofted club to the ball at address. Keep your weight forward during the swing and pick the club up with an early wrist break before smashing the heel of the club into the sand behind the ball to make it pop up onto the putting surface.